SINGAPORE - A fire, which took more than 24 hours to extinguish, broke out at a farm in Lim Chu Kang last Friday (June 1). The Singapore Civil Defence Force said it responded to the fire at 21 Neo Tiew Lane 1 at about 10.30am. The fire involved a large pile of wood waste, measuring approximately two football fields in area and 15m high, said the SCDF spokesman. "The deep-seated fire, which was contained within the premises, was extinguished by SCDF using six water jets on Saturday evening," the spokesman added. "SCDF is currently working closely with the affected company to excavate the pile of wood waste to ensure effective damping down of the area." The Straits Times understands that the fire was located within the farm Malaysian Feedmills. Chief executive of Bollywood Veggies, Ms Manda Foo, whose farm is next to Malaysian Feedmills, told ST that she saw "huge plumes of smoke rising up to the sky" on Friday. "It looked like an industrial fire," added Ms Foo, 32, who is also the executive secretary of the Kranji Countryside Association. "It's a big environmental hazard and it caused haze in the Kranji area." She added that she has observed regular burning activities "at least once every few weeks" at the farm. While some farms do conduct some burning for agricultural purposes, Ms Foo added: "If it's visible from another farm, it's out of the ordinary." Separately, a reader living in Marsiling reported hazy conditions and "a whiff of burnt wood in the air" on Sunday. On Monday, ST reported that slightly hazy conditions were spotted in a few areas in central Singapore. 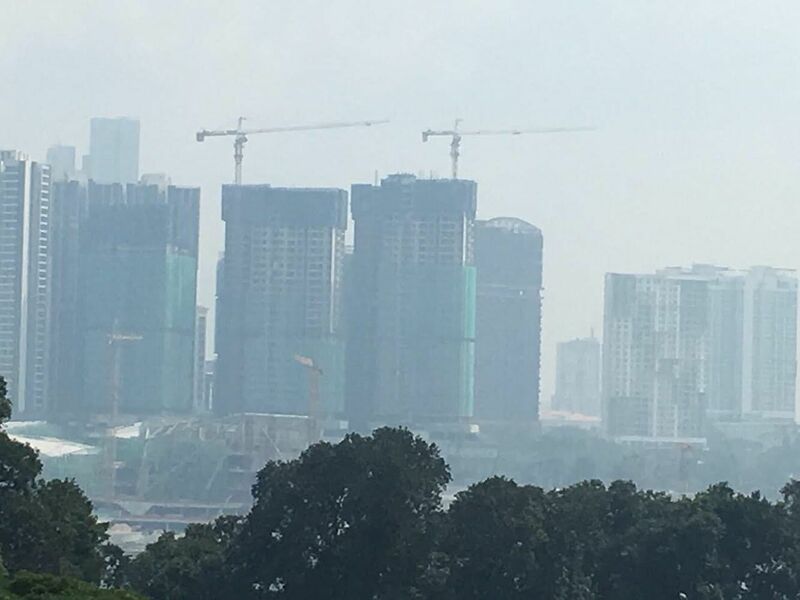 In response, the National Environment Agency said that this was due to accumulation of particulate matter in light wind conditions, and not an indication that the regional haze was back. It is unclear whether the hazy conditions, particularly in Marsiling, are linked to the farm fire last week. The SCDF is investigating the cause of the fire, said the spokesman.